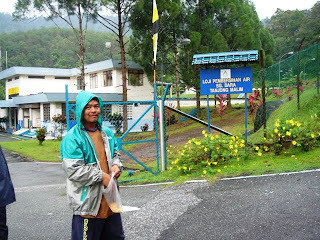 Tanjung Malim is a parliament constituency in Malaysia and is a town in the state of Perak. 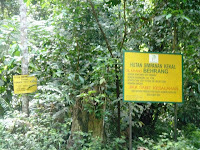 It is approximately 70 km (43.75 miles) north of Kuala Lumpur via the North-South Highway. It lies on the border of Perak-Selangor state, with Sungai Bernam serving as the natural divider. 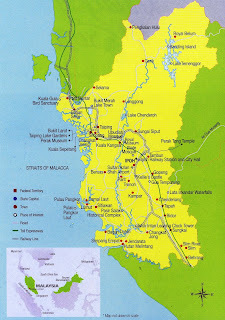 Today, "Tanjung Malim" usually refers to the territory under administration of Tanjung Malim District Council or Majlis Daerah Tanjung Malim (MDTM), which includes the smaller towns adjacent to the town such as Proton City, Behrang, Behrang 2020, Sungkai and Slim River. "Tanjung Malim" is lately also referred to the Old Town and New Town divided by the KTM Komuter rail at its heart, from which the town grew. Commuter train services from Tanjung Malim is expected to begin in 2010. In the early AD1700, a Bugis settlement was established along the riverbank of Sungai Bernam, as part of Raja Kecil's plan to set up one of its kubu, fort along the river to fend off the northern Perak Sultanate threat. The plan fell apart with the fall of Raja Kecil in Johor Sultanate power struggle. Over the century, the small village known as Kampung Kubu/Bugis remained idle or rather isolated. 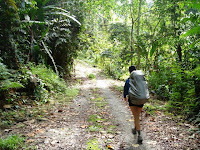 We started trekking at about 10.15 am from a starting height of about 500ft above sea level and a slow gradual trek passing through Behrang Permanent Forest Reserve. Cross over 4 to 5 streams, in the month of November and with the wet season, definitely leeches were giving us a 'high 5' to latch onto our shoes as we pass by. Well this time we were prepare with some other counter measures. 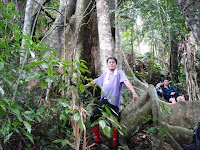 We used Camphor Soap Pagoda Brand and the active ingredient eucalyptus oil that repel leeches. Do not pull leeches off as this can tear the skin and cause infection, its better to use salt or fire to make them drop off. On our way we didnt have any problems with them but after getting wet from crossing the river eventually one or two will have their feast. 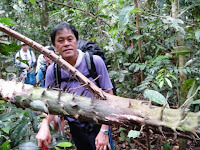 As Wong discover a leech bite at the neck area. As we past the last waterfall crossing which is crystal clear. 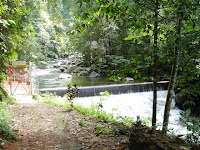 The height here is around 1800 ft and there and a good place to camp and swim near the waterfall. Average time taken is around 1.5 to 2 hrs. From here onwards the trek is up up and up until about 4500ft where our campsite is. It takes about 3 to 4 hrs to reach the campsite with drinking water source down a 70 degree slope which takes about 3 mins. With 15 kg on my back and with the many steep slops, big fallen tree crossing and many thorns to content with I reach the campsite at around 3.15 pm. 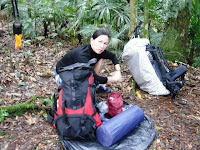 We were over confident, its raining and cold and both my calf felt sore, and the campsite floor was literally cover with tree roots which makes sleeping over it challenging. Wong and KC arrive around 4 pm thanks to Chong who help to carry KC's backpack up. As I tried to set up camp alone in the rain proves difficult. After setting up camp and cooking area, KC settle down to prepare a hot tea drink before dinner to warm up our bodies. Its raining at 4500 ft and to take a bath is brrrrr..... cold. Our menu for tonight is Salted Chicken bought from My Lim Salted Chicken (Semenyih) and vegetables. Our dinner was rudely interrupted by pesky sand flies which inflicted painful bites (itchy) on the exposed skin especially on our face, hands and feet. 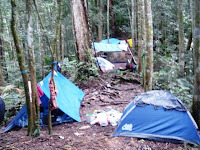 We forgot to bring our mozzy guard and after our meals we rested in our tents. My face was flushing hot and full of sand flies bites, sore calf and tired legs. Slept early at around 7.30 pm and it started raining and since our campsites is situated on a ridge and exposed on both sides it gets windy and very cold in the night. The next morning the group departed towards the peak which is a 2000 ft steep climb and takes about 1 to 1.5 hours to reach. KC and myself decided not to proceed due to body aches and pains. They left around 8.30am and reach Gunung Liang Barat (West) and Gunung Liang Timur (East) and descend an hour later and came down around 12 pm. We approach our guide and request to carry my backpack down for a fee. I realize that I would have a painful problem descending to our car park, a very wise move. Well the lessons we learned is never underestimate any mountain especially since we have completed the the 7 G7's Mountains of Malaysia. Train adequately and always ensure check list is strictly adhere to. Otherwise it has been a good experience! where can i get the guide no for their services? hi, interesting site.. visit mine and support us! thank you.